We believe that it is paramount to educate our children on the importance of living sustainably. We staff a full time Recycling and Public Outreach Coordinator dedicated to public education; our presentations can cover a wide scope of environmental issues, waste management/ recycling, and composting. All presentations are free and we can tailor them to fit any required curriculum. We also offer tours of our recycling facility, transfer station, and recycling center. Please contact Jennifer Arbuckle at 876-3345 or e-mail her to schedule a presentation or tour. 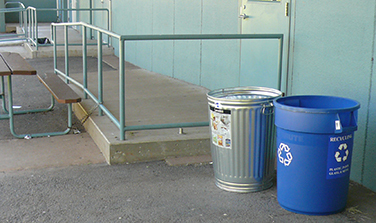 We will tailor fit recycling programs to your campus. All recycling carts and bins are free of charge. We also have various inside containers to help make recycling easy. Below is a over view of the services we provide for schools and businesses. Click here to see container sizes. Recycling is not difficult, but a successful program is dependent on adequate participation. We start by obtaining support from the School Administration, custodial staff, and then educating all participants in the program. We perform waste audits to evaluate which recyclables are generated in different locations in order to determine the best recycling bin locations. 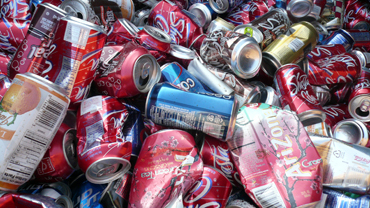 An audit will show the quantity of waste that is recyclable. 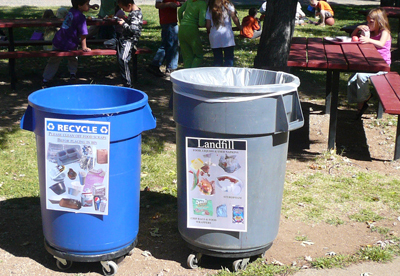 We will also conduct a waste audit of your classroom, or home using these concepts. We make sure all recycling bins are well marked to ensure they will receive the intended recyclable material. We work with school budgets to consider whether investments in recycling containers with restricted openings are necessary to cut down on contamination. We work closely with custodial staff to develop a collection system that will be manageable. Adding recyclables to daily collection routines does not increase the amount of material generated. Thus, it is important that all participants know where recycling goes so that they don't end up in the trash. As a result of the recycling program, you will find that recyclables are being diverted from the waste stream. This should allow the school to reduce the size of waste dumpster's or the frequency of pickups. By doing this the school may save money. If recycling is implemented properly for every school in the district, the savings can be significant. We educate and re-educate students, staff, parents, and administration to maintain and update students and staff on the progress of the recycling program in order to involve them in the program and to demonstrate their contribution to improving the environment. When you bring your CRV beverage containers down to our Recycling Center you can have the money donated to the school of your choice. We will increase the standard rate and send a check to your school. Encouraging your class to recycle not only helps the environment but helps our schools as well. To sign up for our donation program please contact Customer Service at 876-3340. •Use a lunch box or reusable sack. •Pack a cloth napkin and reusable utensils. 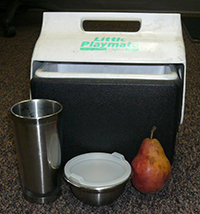 •Put food in reusable food and drink containers. •If you must use a disposable plastic bag wash it out and keep reusing it. •Purchase your snacks in bulk size and repack into individual reusable containers. •Pack fresh fruit since it doesn't require any additional packaging. •Offer a choice of food rather than serve everyone the same so that less food ends up in the trash. •Use recyclable or compostable trays and utensils rather than one time use ones that are thrown away. •Start a vermicomposting (with worms) or composting program on your school site. You can compost almost all of your food waste except for fats, oils, meats, cheeses and dairy products.